"The great popularity of gambling games in the frontier West and the perceived need for the professional gambler were inevitable and predictable. In that historical time and place everyone was to some extent a gambler. All who sought fortunes in the West were betting on the land, the future, and themselves. It was a period of great enthusiasm and optimism, for all were convinced that huge rewards awaited those with nerve enough to take a risk. For those too impatient to wait for the claim to produce a bonanza in gold, the cattle to multiply, or the town to develop, the gambler's table offered an opportunity for instant riches. It was a time of almost unlimited personal freedom and it was a loose, tolerant society with few to say that gambling was a sin, a crime, or a folly. Of course, the professional gambler himself was a product of the same nineteenth-century American influences; he had simply turned to the tables earlier and had made a profession of seeking his fortune there. Not many gamblers found a fortune, but there were those who discovered at the tables an exciting way of life, a calling as true and as real for them as law, medicine, or the clergy was for others." "There were almost no winners in the race for riches in the heady days of the Old West. Almost nightly, a gunshot would reverberate through the darkening spread signaling the hasty departure of a fortune-hunter, a prospector killed for his 'claim,' or a gambler over a five-dollar pot. 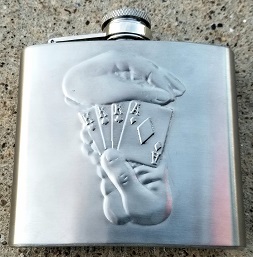 It was to the advantage of the saloonist or the shootist to be proficient with a gun, or knife, for very often a man's life cold be aced out at the turn of a card. 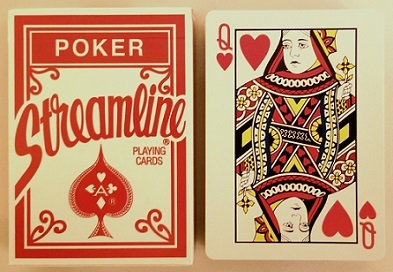 Most of the professional gamblers ... were marksmen, as well as card sharks. It is they who have become the most baroque representatives of Western history." "They were members of the western fraternity known as 'sports,' professional gamblers whose 'chief delights [were] wine, women and billiards; their occupation is faro, and occasionally a game of 'draw.' Sports never exerted themselves too much except in the pursuit of easy money, which is why they were often referred to by their contemporaries as 'genteel loafers.' Most men took such disparagement in stride because they were proud of their calling." "Not all gamblers were cutthroats. Many were professionals who viewed the gaming tables as a calling, just as the cowboy viewed cows, or the miner a quartz-laden wash. One early Deadwood resident said, 'Always they wore their poker masks and spoke with quiet voices. Winnings and losings alike left them apparently unmoved.' Another added, 'In Deadwood Gulch you've got to be a good loser. That's what life on the frontier is -- chance. The professional gambler just goes a littler farther with the game, that's all.'" "The gunfighter as portrayed in the movies, the television screen, the dime novel and popular folklore is a myth. The drama of two gunslingers meeting in the street at high noon, the lightning fast draw, the roar of exploding powder, the impact of bullets, the crumpling of a body; these situations were, and are, illusions. They had little if anything to do with reality. ​ "Of course there were shootouts. Many card games erupted into violence. Guns flashed and people died, especially innocent bystanders. These opponents were not gunmen in the accepted sense of the word nor were they dextrous with a revolver. A bonafide gunfighter rarely let himself be drawn into this type of trouble. Instead he sought the percentages and drew his weapon when the odds were on his side. Most shootings took place between cowhands, farmers, businessmen, drifters; men usually under the influence of liquor and not professional gunmen. ​ "The term 'gunfighter' did not even exist one hundred years ago. Newspapers usually referred to such characters as 'gunmen' or 'shooters.' 'Gunfighter' and 'gunslinger' are modern terms cranked out by Hollywood wordsmiths and popular fiction writers. 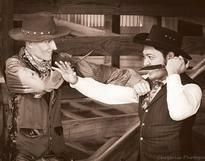 ​ "The fast draw is a modern innovation. It did not exist in the so-called Wild West. In the period between the late 1850's and the early 1890's (heyday of the gunfighters), few towns had been terrorized by roving outlaw gangs and almost none had ever seen a gunfighter." "Practically all towns west of the Mississippi had laws against carrying weapons. People ignored these ordinances but, nevertheless, kept their six-shooters out of sight. Guns were either tucked inside a belt, slung from a shoulder holster or shoved in a pocket. Gunmen dressed about like everyone else; they wore city clothes. They never worried about blinding speed but sought to gain the advantage, drawing and shooting when the opponent least expected it. Those who did wear belt holsters invariably rode them high on the hip where it was more comfortable. The now familiar Hollywood 'hoglegs' would have popped the eyes of a western citizen." "The traditional uniform of the sport consisted of a snow-white shirt, tailored suit, fine jewelry and polished boots. ... The jewelry of choice among Fort Worth sports included such items as diamond rings, diamond shirt studs and diamond-mounted watch charms." "As a class, gunfighters did not conform to the stereotyped image of the motion pictures. Generations of Western fans have seen them portrayed as cowboys, gamblers and occasionally in the guise of a frontier scout complete with buckskins. But the cowboy image dominates. 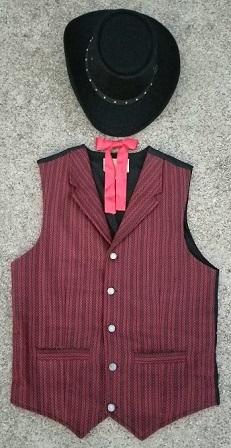 From the earliest appearance of the Western film in 1903, the dress and manner of the gunfighter has been reflected in the image of the cowboy. The huge sombrero, neckerchief, double or single gunbelt, knee high boots (worn with pants tucked in or pulled down over them), and jingling spurs, all served to create a false image of the man behind the gun. In reality, most gunfighters dressed normally according to the current fashions of the time, and would probably be missed in a crowd. Only when they openly carried pistols would they command much attention." "Revolvers in the Old West were not too reliable but they were fairly accurate and reasonably durable when maintained properly. The most popular weapon was the Colt Single Action .44 or .45 with the four and three-quarter-inch barrel and black rubber grips. A popular name for the Colt .45 was the 'Peacemaker,' although many rueful men dubbed it, as well as all other single action models, the 'Thumbbuster.' These weapons had to be cocked by pulling the hammer back before firing. This was done by using the second joint of the thumb (and not the ball of the thumb). A careless handler often received a busted thumb for his efforts or shot himself in the leg or the foot." "The typical saloon might look like a conclave of heavily armed desperados when the place was busy. Few men were brave enough or foolish enough to enter a bar unarmed. Never mind the ordinances against carrying guns; those were widely ignored anyway. Many men carried, in addition to their six-shooter, a knife of some sort for close-in fighting. Even if a man checked his gun at the door, he hung onto his knife. The result of having so many well-armed men in such a confined space is best described by a small-town Kansas newspaper of the era as 'more like an arsenal than a bar room.' And it was not just the customers who were well-armed. The same newspaper said the barkeeps were often more heavily armed than the customers." "Many gunslingers carried a hideout gun as a backup. Perhaps a 'belly gun' -- a small, short-barreled revolver -- was slipped into a coat or pants or vest pocket. More popular was the derringer, only a few inches long and easy to conceal. 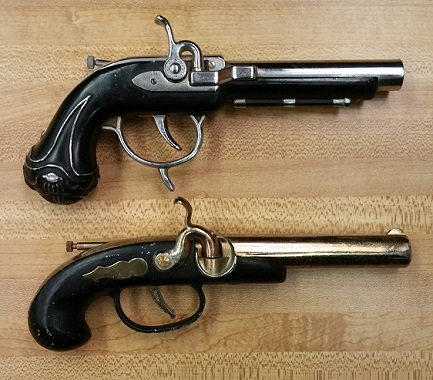 More than 150,000 of these .41-caliber Remington 'Over and Under' hideout guns were sold." "DERENGER. A type of pistol originally made by Henry Deringer of Philadelphia, but extensively copied by other makers. Deringer made pistols of all sizes as well as rifles and swords but the one that goes by his name is very small. The barrel was usually about an inch and a half long, though of 0.41 inch bore. It was carried in the pocket and, on occasions of emergency, fired through it. Deringers whether of the original make, or copies, were extremely popular in the South and in California in the middle of the last century." "These were carried by gamblers and settlers in the West and were of sufficient caliber to give the user ample assurance of protection." "deringer American single-shot, muzzleloading percussion pistol of small size which took its name from its make, J. H. Deringer of Philadelphia (1786-1868). It was very popular from the 1840s as a pocket pistol. Later the term came to be used for any similar pocket pistol, and spelled 'derringer.'" 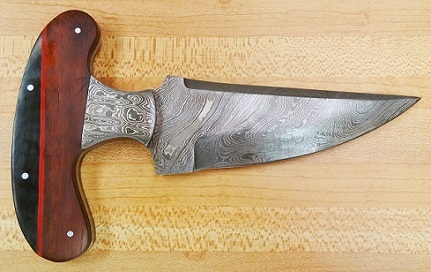 "Daggers such as this are usually associated with dishonest gamblers of the American West. It was easily concealed and could be produced surreptitiously. The handle was held in the fist, and the blade between the fingers, allowing a fatal punch to be delivered." "... [A] classic American weapon of the early 19th century was the push dagger. This deadly little weapon was composed of a stout double-edged blade with a short, round-section tang that terminated in a transverse grip -- of bone, horn or wood -- giving the dagger an overall T-shape. A man would grip a push dagger in his fist with the blade protruding between the middle and ring fingers, the base of the blade sitting a little less than 2.5cm (1in) above the knuckles. He would strike a blow with a swift punching movement; bystanders might not even be aware that a knife attack had occurred, not even the victim until he caught sight of his own blood. 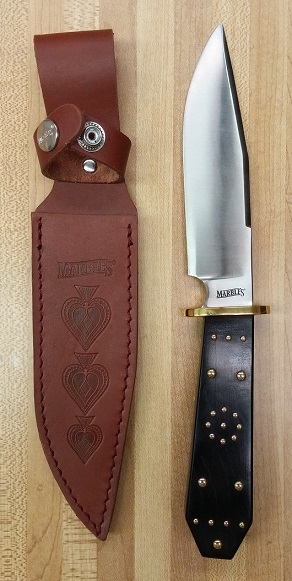 "The push dagger scabbard was often made to be worn upside-down inside a coat or jacket, having a spring clip to retain the weapon and a hook on the end of the chape for suspension. 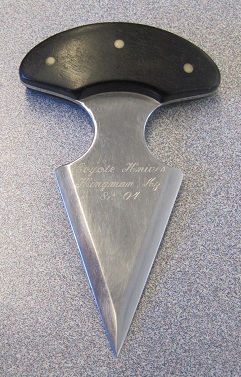 In this way a man could easily secrete [sic] a push dagger about his person and draw it quickly when the need arose. Almost all surviving examples (before their re-emergence in the 20th century) seem to date from before around 1860."